Need a sugar rush to get you through the work day? How about 3 dozen doughnuts from our friends at Cothran’s Bakery delivered to your office?!?! 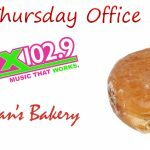 To submit an office or workplace to win, send entries to shane@wkxx.com and tell us what you’re working on at the moment that makes your work place deserving of a Cothran’s Bakery “sugar rush”. We’ll choose 1 office Thursday morning in the Morning Mix, then Shane & Suzanne will deliver to the winner.